Professor McFarland's interests are in the field of experimental high-energy physics. His primary research interest is the study of neutrino properties and their weak interactions. The ultimate goal of these high intensity accelerator-based neutrino experiments is determination of the neutrino masses and the mixing between neutrino flavors and these masses through neutrino flavor oscillation measurements. Violations of matter-antimatter symmetry may be possible in neutrino mixings, and they may offer an explanation for the origin of the dominance of matter over antimatter in today's Universe. Professor McFarland is the co-spokesperson of the MINERvA neutrino experiment at the NuMI neutrino beam at Fermilab which seeks to precisely measure neutrino interactions in order to improve current and future precision neutrino oscillation experiments. 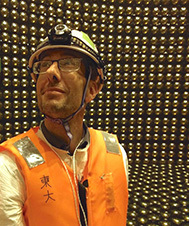 He also works on the T2K experiment at J-PARC in Japan which is the first of the current generation of experiments searching for muon to electron neutrino flavor transitions. He collaborates with Profs. Manly and Bodek to form the Rochester neutrino group. He has recently worked on electroweak and top quark physics at the CDF experiment at the Fermilab Tevatron collider and studied the neutrino neutral current interactions at high precision in the NuTeV high energy neutrino experiment at Fermilab.